Although the dental profession unanimously supports the use of mouthguards in a variety of athletic activities, patients remain resistant to wearing them. A mouthguard is the very best protection for an athlete’s smile. It is essential equipment during any form of contact sport and even in many non-contact sports. Most people, kids included, have experienced the “weekend warrior” syndrome, in which they think they are invincible to injury and shun protective gear such as helmets and pads. In particular, protection for the teeth is often forgotten. Both pick-up games and supervised sports account for many orafacial injuries, with soccer claiming the most, followed by basketball and football. 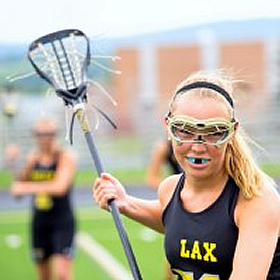 It is estimated that mouthguards prevent more than 200,000 orafacial injuries each year. The Academy of General Dentistry recommends that players who participate in basketball, softball, wrestling, soccer, lacrosse, rugby, in-line skating and martial arts, whether for an athletic competition or leisure activity, wear mouthguards. Over-the-counter mouthguards provide adequate protection, but if you find you have difficulty keeping them in place, or you are involved in serious contact sports like hockey, lacrosse or karate, you may consider having one of our doctors make you a custom mouthguard. Contact us today if you have additional questions about the protection a mouthguard can offer.